Chimwemwe mu’bereki (CU)*, translated as Joyful Motherhood in English, is the Malawian sister organization carries out the work in Malawi. The success of our programs directly reflects of the quality of nursing care we provide to the women and babies in our care. Joyful Motherhood needs excellent nurses who are passionate about our mission. Since the majority of the work occurs in communities where little or no English is spoken, and where an understanding of the cultural context is key, Joyful Motherhood hires only Malawian nurses who have previously retired from government service and offers per diem positions to nurses who are currently full-time government employees. Joyful Motherhood currently employs four full-time nurses, seven per diem nurses, a part-time secretary and a part-time accountant. It is impossible to overstate the dedication of our nurses. Nurses build relationships with their clients, regularly give from their own pockets to families in crisis, and routinely spend hours in all weather searching for the home of a sick mom or vulnerable infant. We have finally secured a vehicle to help transport nurses to and from remote sites, but in most cases, nurses make their way to the homes of clients via public buses, bicycle taxis, and on foot. Joyful Motherhood nurses consistently give much more of themselves than we could ever request. Beatrice is the heart of Chimwemwe mu’bereki. 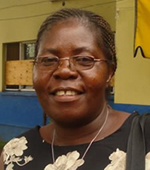 She is a Malawian nurse with over 30 years experience in maternal and child health. Beatrice has been with Joyful Motherhood from day one and both the survival and growth of the organization is in great part due to her efforts – walking miles and miles in the villages, spending hours educating mothers and communities, recruiting and training program nurses, repeatedly educating hospital staff to ensure that babies do not slip through the cracks, networking to spread the word about our work. Beatrice is the original shining star in our small but growing galaxy. * AMHI currently provides assistance to CU in the form of management, program development, and financial support. AMHI reserves the right to cease support of CU for any reason, including a determination by AMHI’s Board of Directors that support of CU is inconsistent with AMHI’s charitable purposes under Section 501(c)(3) of the Internal Revenue Code. Based on CU’s stated purposes and track record, AMHI believes that its support of CU is, and will remain, consistent with AMHI’s tax exempt purposes.